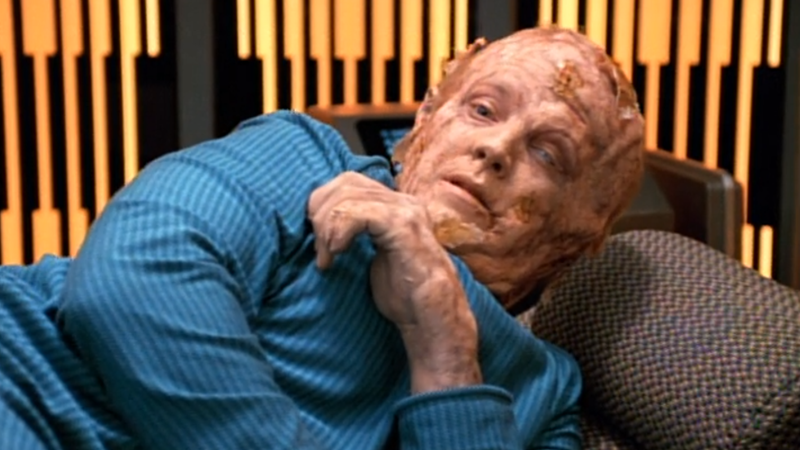 “Threshold” is one of the most infamous Star Trek episodes ever. You know what’ we’re talking about—the one with Warp 10 and the weird evolved amphibians. Well, it was also the recent subject of a fake scientific research paper submitted in a test to expose the ever-growing problem of “predatory” scientific journals. An anonymous biologist looking to expose how easy it was to get fake news into supposedly peer-reviewed scientific journals—inspired by a recent attempt that got a paper about Star Wars’ midi-chlorians published in three different journals—recently submitted a paper titled “Rapid Genetic and Developmental Morphological Change Following Extreme Celerity.” The author was listed as “Doctor Lewis Zimmerman,” which is actually the name of the holoengineer that programmed Voyager’s Emergency Medical Hologram. The paper was essentially a recap of the events of “Threshold,” the godawful season two episode in which Voyager’s helmsman Tom Paris attempts to break the theoretical “Warp 10” speed barrier, something never done in Trek’s universe. Turns out, it’s for good reason, because apparently when you do reach the “extreme celerity” of Warp 10, you turn into a weird amphibian-person, capture your captain, evolve them into a weird amphibian-person, and then fully evolve into actual space salamanders and mate with each other. But nonetheless, the paper—which, while obfuscating its language a bit, was still very clearly fake, including mentions of the transwarp barrier Paris breaks in the episode and even concluded by thanking the United Federation of Planets and Voyager producer Brannon Braga—was accepted by four different journals, and actually published in one, American Research Journal of Biosciences. According to a Space.com interview with the anonymous biologist who submitted the paper, the journal asked for just $50 to do so. ARJ have now pulled the text from their website in light of media reports discovering that the paper is essentially a fancier-worded Memory Alpha page. In the world of science publishing, the rise of “predatory” journals and a lack of proper checks on the papers that get accepted into them is a growing, disconcerting problem. Multiple sting operations into exposing the issue—including an alarming report by journalist John Bohannon in 2015, who managed to get a scientifically accurate, but intentionally poor and catchily-presented study, into predatory journals that then went on to work its way into the media—have occurred in recent years. But with efforts like this Trek-themed paper and last year’s midi-chlorian one, it shows that it’s not just poorly-conducted research making its way into journals, but blatantly false papers as well. In a time when public faith in science is more important than ever, practices that allow for jokey incidents like this to happen only help to erode public trust in even the best science publishing. Edit: A previous version of this article referred to the beings Captain Janeway and Tom Paris evolve into as space-lizards, when they are in fact, space-amphibians. io9 regrets the error, and notes the delightful irony of scientific inaccuracy in a post about fake science. Should Scientists Be Posting Their Work Online Before Peer Review?